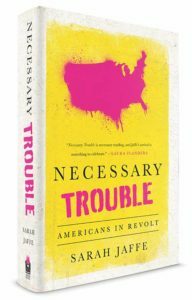 The folks at Dissent, the lovely people who bring you Belabored, ran an excerpt from Necessary Trouble. “I tried for many, many years to be ‘Mrs. All America.’” Nancy Daniel said, sitting in a coffee shop in a northern suburb of Atlanta, Georgia. “I married a guy in the military and divorced him. Had two kids. Tried to do everything right, or what I was being taught was right. And it didn’t work that way. It just didn’t.” She’d greeted me with an embrace, telling me, “I’m a hugger,” although we were there to talk about a sobering subject. Daniel, like millions of other Americans, had been struggling since 2009 to keep her home.